Little feet of our kids are tirelessly traipsing to discover their world. As they clamber around, most certainly they come up with a few cuts and abrasion. 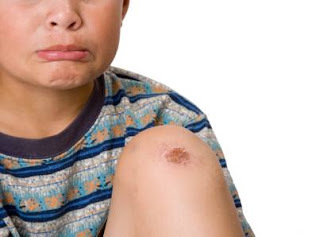 We need to care for these scrapes and scabs to avoid infection. Wash down the wound under running water to irrigate out dirt and debris. Thoroughly wash the wound with mild soap or better to use an anti-bacterial soap then rinse thoroughly. Apply antiseptic like Povidone Iodine (Betadine) and cover the wound with sterile gauze or bandage to prevent them from poking it. Examine the wound daily, keeping an eye out for redness, swelling or pus which is an indication of infection. Have your child sit or lie and raise the bleeding wound above the level of your child’s heart. Seek immediate medical attention for your child once you’ve controlled the bleeding. Thanks for the helpful tips, mommy Joy! God bless! waaaah! this reminded me of the time when I slipped on the side street sewer w/c has broken glass hidden in the dark green water. It tore-up the skin on my right knee and I saw the white stuff. I know it's supposed to be stitched but I'm not sure why my parents did not take me to the hospital. We just kept on cleaning it and applying crushed antibiotics. It took several months for the wound to be completely healed. I cab still remember how may playmates and their parents were so panicked after seeing my open wound. They applied alcohol on the sides and placed some sort of ointment on the open wound w/c kept me crying and screaming. My yaya (nanny) was so enraged "at me" that when she gave me a bath, she even scrubbed the wound.